Your dryer removes about a gallon of water from every load of laundry. The longer that water stays inside your home, the more damage it can cause. Locate your dryer on or near an exterior wall so the vent line can be as short and as straight as possible. Always use metal flexible or rigid vent tubing secured with metal foil tape, not with screws or rivets. White plastic or foil-look spiral tubing, although it’s cheaper, can melt and leak moist air back into your basement, or worse, catch fire. Where the vent leaves your house, install an exhaust hood with a swing-out damper to keep critters out and prevent backdrafts. Make sure it’s got twelve inches of clearance, and never use screen over the outlet. 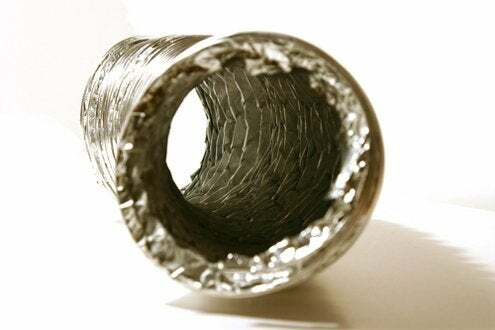 The whole duct should be shorter than 25 feet, subtracting 5 feet for every 90-degree bend. It should always vent directly to the exterior, never into a crawlspace or basement, common duct, or chimney.